This post is about my primitive fishing gear; not to be confused with my survival fishing gear. To me, when I say primitive gear, I’m talking about homemade stuff that I can make with some simple tools out of things around the old homestead. When I say survival gear, I’m talking about stuff that I make out in nature using only natural materials, and using my knife as my only civilized tool. So this primitive fishing gear is made from common items found around the house, and it is made with a few simple hand tools. 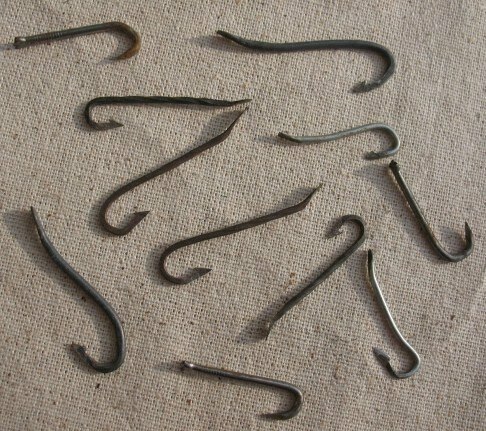 Pictured below: Primitive hooks made from wire and nails. Some have barbs, some don’t. 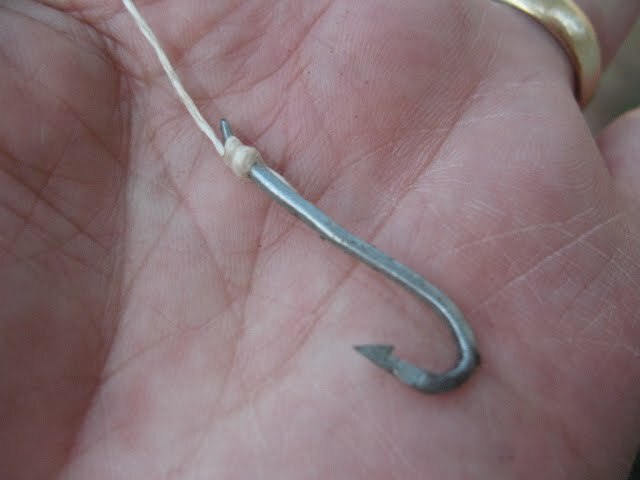 Let’s start with a primitive hook. 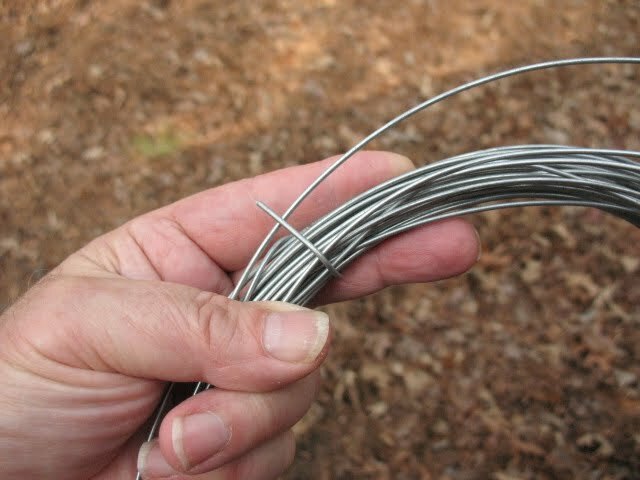 If you have a vise, a hammer, a small file, and a pair of needle-nose pliers; it is not hard to make fish hooks out of the right kind of wire. What is the right kind of wire? Well, it can’t be too soft. If the wire is too soft it will straighten out when a fish starts fighting against it, and you will probably lose the fish. I have some wire that is fairly stiff that makes good hooks. If your wire is too soft, you can try heating the finished hook until it is cherry red and then quenching it in water. Sometimes this will harden the metal. Pictured below: Wire for hook making. 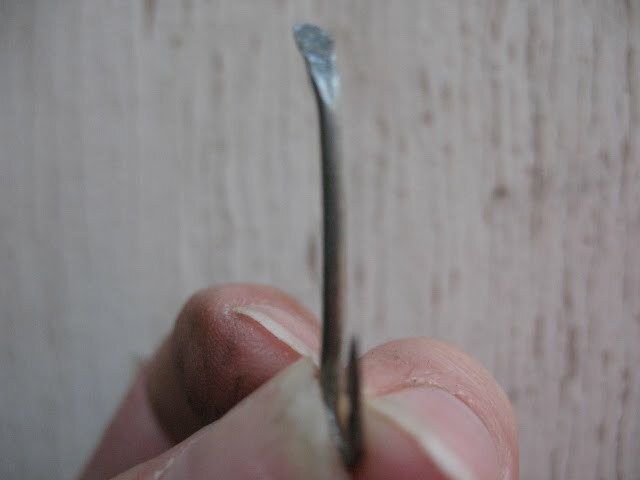 Steel nails can be used to fashion hooks, although sometimes nails are too hard. Again, you can do a little amateur blacksmithing by heating the nail until cherry red, then bending it, and hammering down the end for a barb. A lot of work for one fish hook. It will definitely make you wish that you had bought a few hundred ready made hooks. 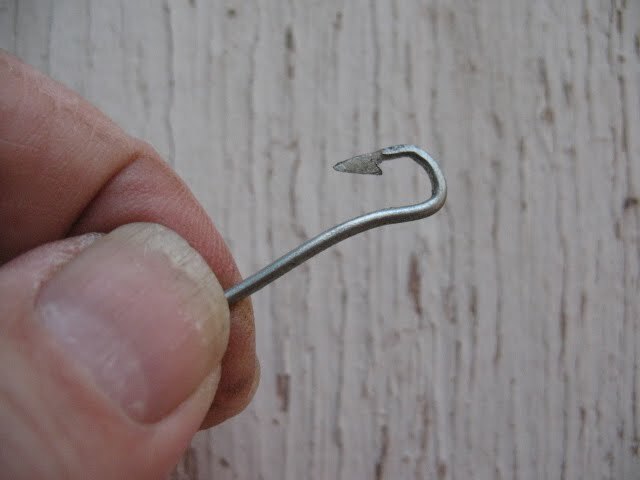 When I was a kid, we used to catch small fish on a bent straight pin. I haven’t tried that in a few years (like 50) but it might be fun to try again. 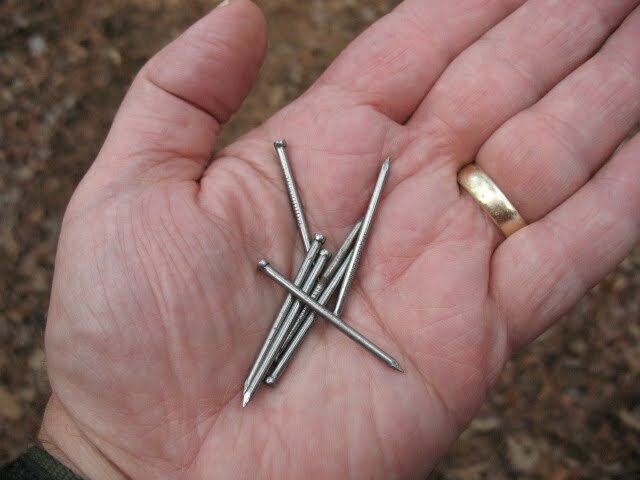 Pictured below: Nails for hook making. So let’s take some wire and make a hook. The first thing to do is to flatten out a small portion of one end of the wire. This is the part that we will file into a barb. The flattening and filing is hard to do after the hook has been bent, so we’ll do it while the wire is still straight. 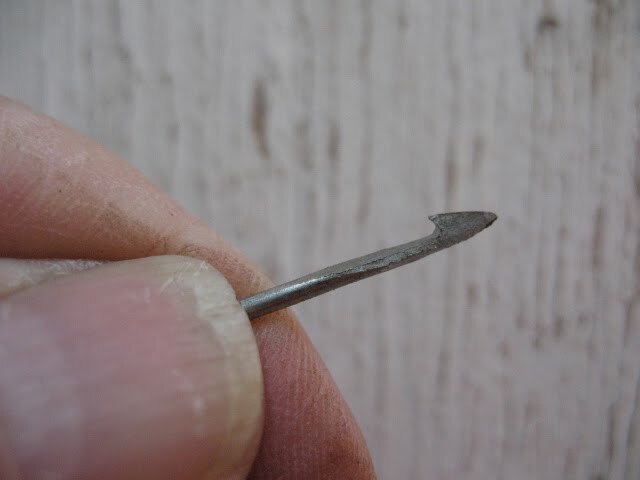 Now put the piece of wire in your vice and use your file to shape the flat into a barb. Make sure that the point is sharp so that it will penetrate quickly and easily. The barb does not have to be large. In fact you don’t have to have a barb at all. I have caught a lot of trout on barbless fly hooks, but if I’m fishing for dinner I would like to make as sure as possible that my hook stays attached to the fish that swallows it. Pictured below: Finished barb. After you have the barb made, you can take your needle-nose pliers and bend the hook. After the hook is bent, use your pliers to cut the shank to length. Pictured below: Bent hook. Do you need an eye on your hook? Not really. Many old time hooks did not have eyes. All you really need to do is wack the end of the shank a couple of times to spread the metal out a little. Pictured below: Shank flattened out and ready for line to be attached, and the finished hook. Once you have a hook, you need a line. Almost any small string will do as long as it’s strong enough to hold a fish. 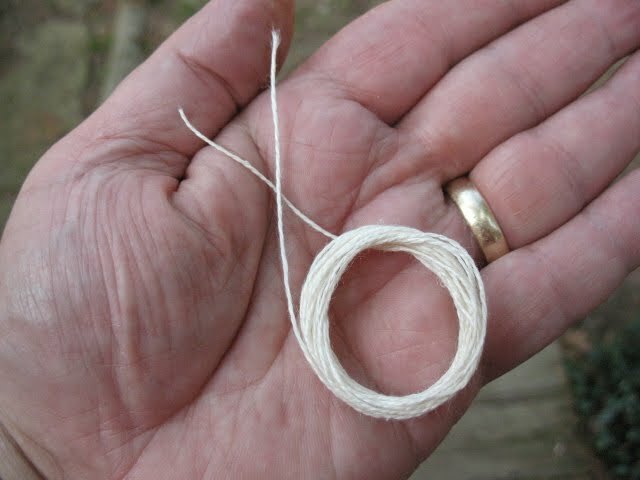 I usually use some small linen twine, but you could use nylon string, bailing twine, or even dental floss. If the string is too big you can unravel it into smaller strings. You will probably need about fifteen or twenty feet of line. Pictured below: Linen fishing line. Your fishing line can now be tied around the shank using a snell knot, and the wide spot on the end of the shank will keep it from slipping off. Pictured below: Line attached to hook. All we need now is a weight, a float, and some bait; and we’re ready to go fishing. Let’s assume that one is prepping for the end of the world. Let’s assume one currently has access to WalMart, prior to the zombie apocalypse. Why not just prep a stash of fishing tackle in advance? Your plan assumes you have nails, pliers, some type of string, files, and other manufacturing implements needed to convert nails into fishhooks. The strategy suggests that you would have more time and resources to make these sub-standard hooks, than you would simply foraging for abandoned hooks and line in any given fishing waterway. Not everything on this blog is about prepping. 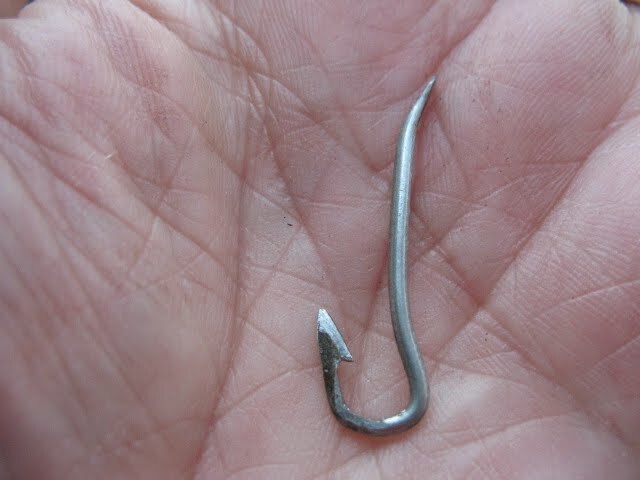 If you are prepping then it is fairly obvious that buying fish hooks makes more sense than buying nails to make fish hooks out of. Just like it makes more sense to store food than to plan on foraging and hunting for your dinner. Here’s the problem. If you are only “prepping” for survival then you are limiting your ability to survive. I used to teach martial arts and there was always some guy who would say, “I don’t need all of that. I’ll just use my gun.” My standard response was, “Do you have it with you?” They never did. Do you take my point. Unless you are spending 24 hours per day at home or wherever your preps are you could be in deep trouble. What if the zombies descend while you are visiting Aunt Edna in Detroit. For that matter, what happens if there is an EMP attack and you are stuck at an office in the city while your supplies are 30 miles away in the suburbs. True preparation is multi-level. Ideally you would have everything that you need, but you have to be able to survive with whatever you have. Learn everything that you can about every aspect of self-reliance. Knowledge doesn’t take up any room, and it may save your life. By the way Trooper, just so you don’t think I’m a total moron, I have 500 hooks of varying sizes, several hundred yards of mono-filament, 5 spin casting rods, 2 fly rods, fly tying supplies, a trot-line, a cast net, and two fish spears in my prep supplies. Just hope I’m close to them when TSHTF. Ha! Your meanings of ‘Survival’ and ‘Primitive’ are the exact opposite of mine. Love your work though! Keep it up.